YellowAirplane.com: World War 2 Japanese Betty Bomber, Model Airplanes, Plastic Model Kits, Diecast Models, Books, DVD Videos, and Aviation Art. World War 2 Japanese Betty Bomber, Model Airplanes, Plastic Model Kits, Diecast Models, Books, DVD Videos, and Aviation Art. of the Prop Fighter Models and Model Kit Department. Japanese Betty Bombers of World War 2, Bomber Aircraft Books, DVD Videos, Airplane Models, Aviation Art. Model kits, model airplanes, diecast models, plastic models, wood models and aviation art. Another famous Japanese aircraft was a bomber known as the Betty Bomber. This was a medium, twin bomber used in many Japanese cap. Some planes were like the WW2 Japanese Jet Planes, the Baka Bomb. Made of Philippine mahogany, this hand painted and detailed, 1/48 scale model of the Mitsubishi G4M3 Model 34 "Betty" - an Imperial Japanese Navy twin-engine bomber - measures 16" long with a 20" wingspan and includes a display stand. a twin-engine G4M1 bomber, nicknamed "Betty" by the Allies, this 1/144 scale die cast metal and plastic model features textured surfaces, rotating propellers, optional position landing gear, authentic Imperial Japanese Navy markings, and more. 6" wingspan; includes a display stand. This limited edition, 1/72 scale plastic kit of Japan's premier World War II heavy bomber features textured surfaces with simulated rivets, a three-seat cockpit with crew figures and glazed windows, the markings of the Imperial Japanese Navy's 705th Flying Group stationed at Bougainville in 1943, and more. 13" wingspan; 75 parts, assembly required. This 1/182 scale die cast model of the long-range Japanese bomber features textured surfaces, glazed cockpit and nose windows, turrets with machine guns, rotating propellers, authentic markings, and more. 5" wingspan; includes a display stand. Tagaya. Built for the Imperial Japanese Navy, the Betty's long range made it a key weapon, but its lack of protective armor and propensity to burst into flames when under fire earned it the nickname "The Flying Lighter." Learn about this craft and its pilots through this volume of 112 pgs., approximately 100 B&W photos, 30 color profiles and more. 7"x 9", sfbd. A Photo Gallery of Destroyed Japanese Aircraft in World War II. Gallagher. Snapped by the author, a communications officer with the Fifth Air Force in the Pacific islands during the final days of World War II, these stunning photographs cover all manner of downed Japanese aircraft, from the infamous Zero fighter to the Betty bomber. Also includes specifications and technical data for many of the types. 144 pages, 180 B&W photographs, 20 illustrations, 11"x 8", softcover. Marc Stewart. An F4U-1 Corsair flown by 10-victory ace Capt. Herbert "Trigger" Long of VMF-122 downs a G4M "Betty" over New Georgia Island in the Solomons on July 7, 1943. 24"x 18" limited edition, numbered print is signed by the artist and by Col. Long. Roy Grinnell. Marine Corps ace and Medal of Honor recipient Joe Foss downs a Betty bomber over Guadalcanal, scoring the 20th of the 22 victories he achieved in 30 days of combat. 30"x 24" limited edition, numbered print is signed by the artist and by Joe Foss. Dan Zoernig. On November 19, 1943, Lt. (jg) Hamilton McWhorter III, operating off the USS Essex, downs a Mitsubishi G4M "Betty" bomber to become the first pilot to claim five victories in the Grumman F6F Hellcat. 19"x 13" limited edition print is signed by the artist. Wrecked military aircraft remained undisturbed for decades at Indonesia's Babo Airfield, a remote air base used by the Dutch, Australian and Japanese forces in World War II. Now, this thrilling 1991 adventure to the remote air base documents the airfield, its wartime history, and the recovery of an A6M3 Zero, a G4M1 Betty and a D4Y1 Judy. Color, Dolby Digital 2.0, 1 hour. C.S. Bailey. Japanese Zeros from the Imperial Japanese Navy's flagship carrier Akagi proceed to the opening strike at Pearl Harbor, December 7, 1941. 26"x 20" limited edition print is signed and numbered by the artist. Stan Stokes. Depicts the December 7, 1941 attack at Pearl Harbor. A Japanese "Kate" from the Akagi launches a Kai Model 2 torpedo at the USS West Virginia during the attack. 16"x 11" limited edition print is signed and numbered by the artist. The N1K2-J Shiden-Kai "George" flown by CPO Shoichi Sugita of the 343rd Kokutai claims four F6F Hellcats and another three probable's during the shredding of an unsuspecting and overconfident carrier strike group near Kure on March 19, 1945. 16"x 11" limited edition print is signed and numbered by the artist. of the island of Ie Shima. 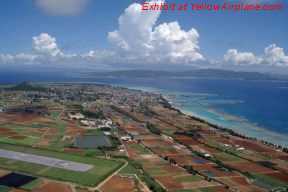 These photos compare the runways of 1940's Ie Shima to the photos of Ie Shima today. Ie Shima was the home to the 34th Fighter Squadron in World War 2. Click Here's the New Ernie Pyle Exhibit. "I Thought I Killed Ernie Pyle." Propaganda Art was used by forces on all sides in WW2 as well as all wars in history. This kind of art gave pride to the citizens of those countries who produced it and gave a unity in support of the wars. This exhibit is an excellent example of Japanese Propaganda art. Here For Aviation Art Prints, Posters and Gifts. The real story of the Japanese Surrender. There was a lot more to the surrender of Japan than signing the papers on the USS Missouri. about people and events involving the Japanese Betty Bomber. Hiroyoshi Nishizawa - the Japanese "Naval Ace of Aces." Stan Stokes. The N1K2-J Shiden-Kai "George" flown by CPO Shoichi Sugita of the 343rd Kokutai (see item #6328) claims four F6F Hellcats and another three probable's during the shredding of an unsuspecting and overconfident carrier strike group near Kure on March 19, 1945. Mitsubishi F1M-2 Pete Seaplane. The Type-O seaplane was a biplane designed to a Japanese Navy requirement for an observation and reconnaissance aircraft, also capable of defending itself when faced with fighter opposition. Used throughout WWII, it was successfully used to hunt and destroy enemy submarines in addition to its reconnaissance tasks. Japanese Zeros from the Imperial Japanese Navy's flagship carrier Akagi proceed to the opening strike at Pearl Harbor, December 7, 1941.